When most people think about the advantages of using social media for business, they immediately think of the marketing benefits. However, many businesses are starting to use social media as a tool for listening and providing customer service. When a crisis or emergency erupts, the power of social media can be an amazing tool for businesses. A crisis can include anything from a simple website outage to negative publicity. This article will reveal how to use social media during a crisis and provide many examples you can model. Why should a company be concerned about social media’s influence on their image? The answer is simple: Social media allows consumer opinions to spread far and wide quickly. Word of mouth and social search are two powerful reasons to manage your social media reputation. Imagine you’re a restaurant owner, and you recognize a customer walking into your establishment as someone who has a wide influence in your community, such as a newspaper writer. You would want him to have the best experience possible so if he chooses to write about your restaurant, those who read the review would be impressed and possibly come in to have a wonderful experience as well. Social media allows anyone to be a major influence in the community. Any customer who walks through your door could possibly have hundreds or even thousands of followers in your region, or if not, his friends might. Word of mouth marketing can reach a worldwide audience through social media; thus, one bad experience could be retold to the masses. Google’s recent implementation of social media in their search results brings real-time conversation to the front page. Twitter users in particular are fond of hashtags, and just adding a hashtag in front of a search for a name brand can reveal what is currently being talked about in relation to that brand. Take Toyota for instance. Adding the hashtag in front of the name reveals the following in the first page of search results. Now, let’s look at what happens if you do the same for Ford. You can see why social search could be very influential on a searcher’s perception of a brand. Now that you can see why social media is important to a company’s reputation, let’s look at how large and small businesses have used the following social networks to respond to their customers. Although Twitter communications happen in 140 character updates, these tweets are easily searchable by Google, Twitter, and the many Twitter applications available. Businesses can be followed on Twitter by anyone – customers, potential customers, and competitors. By now, everyone has heard about the major recalls by Toyota due to defective “sticky” gas pedals in many of their vehicle models. 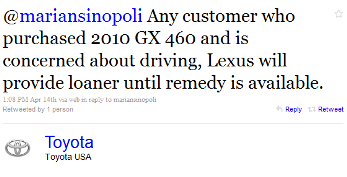 Toyota has been monitoring and responding to their customers’ questions on the recall via Twitter. Codero, a web hosting company, experienced a power outage that affected their servers, leaving their clients’ websites down. Codero responded directly to their clients through via Twitter throughout the next several days. Although there were many complaints about websites being down, there were positive referrals to their followers by clients who were satisfied by the customer service they received. YouTube is the most popular video search engine, and no doubt the best (and fastest) way to send out a public announcement when your company needs to make a statement about an ongoing situation. Lexus Group President and General Manager Mike Templin recorded a personal message on YouTube for their customers (see below) on the LexusVehicles channel, assuring them that Lexus is dedicated to building high-quality vehicles that surpass expectations and, in response to Consumer Reports’ review of the rollover risk of the GX 460 SUV, are voluntarily recalling this model to upgrade and improve the vehicle’s stability system. Codero Chief Operating Officer Ryan Elledge uploaded a video on CoderoTV the morning of their power outage, giving a preliminary explanation of the situation (see below). One important thing to note when using YouTube for crisis management announcements is that unless you set your options to moderate comments, YouTube users can add comments to videos that are available for public consumption as well. In both of the above examples, the company has an opportunity to include positive responses (when possible) to any negative comments made on their videos. If your company has a Facebook fan page, it will be another social media outlet to focus on supplying excellent customer response. Depending on your page settings, fans can post comments to your page which be seen by fans and non-fans alike, so it is important to monitor your Facebook page and update it as needed with the latest news and responses to customer comments. 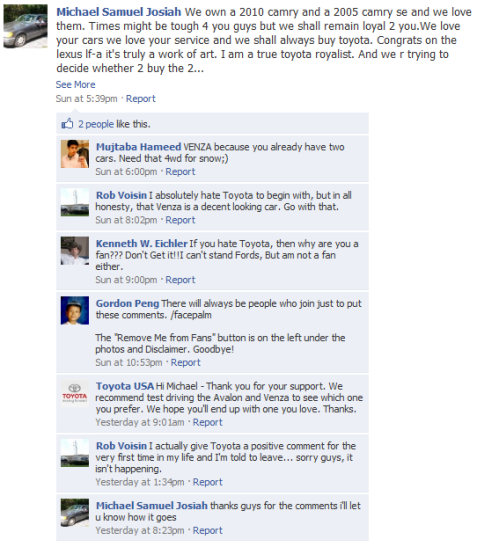 Toyota’s Facebook page, having almost 100,000 fans, is constantly updated by both Toyota and fans with both praise and complaints alike. Because of the volume of comments, Toyota does not seem to comment on each status, but that doesn’t mean they’re not responding at all – they simply may be making more comprehensive responses behind the scenes via private emails to the fans. It’s good to see the public responses, assuring fans that someone is actively getting into the discussions, rather than just posting news updates. 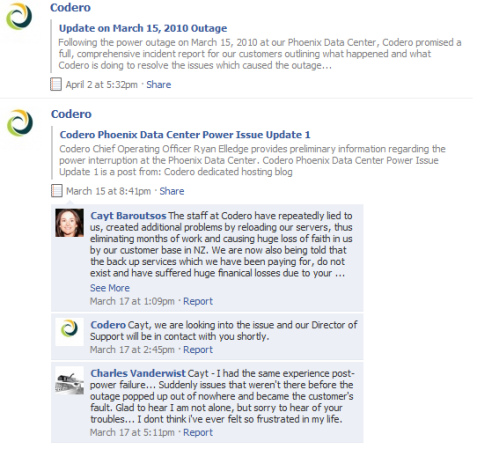 Codero’s Facebook page did not receive as many responses from clients affected by the power outage as their Twitter accounts; however, they not only made an update directly on Facebook about the outage, but also directed customers to watch real-time discussion of the situation on their Twitter accounts and linked to blog posts which contained the YouTube video update. They also updated their fan page to update customers to assure them that they were working on a comprehensive analysis of what went wrong and ways they would prevent such an outage from affecting their customers in the future. So what are some best practices you can take away from these examples? Social media is public. Your fans and followers have the right to make negative comments – it’s your company’s job to turn those negative comments around and defend yourself to change it from a negative to a positive situation. Monitor your business on social media and respond to tweets, mentions, and comments on your company’s profiles in a timely manner. Social media is real-time, so the faster you respond, the better your customer service will look. If possible, suggest that customers contact you privately to send their email address or phone number for more in-depth discussion. On Twitter, you must follow the customer so she can direct message you. On Facebook fan pages, you must share a personal profile the customer can send a message to. On YouTube, customers can visit your company’s channel and send a message. Remember that aside from private messaging, anyone can read conversations between you and your customer. If you provide thorough, great customer service, it can go a long way in impressing your customers, increasing their likelihood of giving you positive referrals. And for other followers who are watching the situation unfold, it could be a great first impression that leads to a potential customer. Do you own a business and have you used social media to respond to customers in times of crisis or in the face of negative publicity? Or are you a customer who has had a positive or negative customer service experience from a business on social media? Please share your thoughts and best practices in the comment box below.